Burglaries and break-ins are now on the rise so surveillance system has transitioned from being a mere luxury to a big necessity. In the previous post we have explained a list of reasons why you need a home security camera. Got a wireless security camera or PoE security camera? Good for you. It helps ward off burglars and intruders to protect your home while you are not around. If not have one? Everyone knows that it costs quite a fortune to install a highly sophisticated surveillance system in your home. But not to worry, you can set up an effective but cheap webcam security camera by yourself. Here is how to turn a webcam into a security camera, and you will learn the detailed steps to set up home surveillance with a USB-connected webcam or built-in PC/Mac webcam to protect your home when you are not there. How to use the webcam as CCTV camera? To turn a webcam into a security camera, the first thing you need is the webcam security camera software. 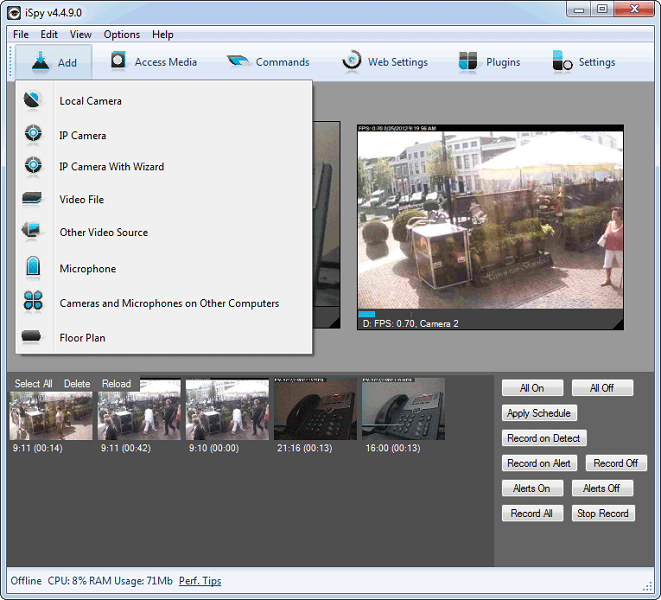 Through the particular software to use webcam as CCTV, you can view and record live videos detected by a webcam. The webcam security cameras also enable motion detection, sending email alerts and uploading videos to FTP. When you are out, you can remotely access the webcam security camera to stay informed about your home and loved ones. In the following, I list some of the most widely-used webcam security camera software to help you turn a webcam into security camera easily and quickly. iSpy turns webcam into security camera to detect sound or movement to provide home surveillance. This webcam security camera app is free to use, but some of its features are premium, such as remote viewing. Recently iSpy only works with Microsoft operating system (Windows 7, 8, 10, etc), and some users say the video quality is horrible. Yawcam is Windows webcam security camera software, letting you view everything happening in your home and office. Its motion detection is great, and it also supports FTP upload. Yawcam has limited features, but it is free to turn webcam into security camera. SecuritySpy allows you to use webcam as security camera on Mac. It will intelligently detect any events and send you alerts. It is not free software to use webcam as CCTV and usually costs£30-£80 depending on the number of webcams you connect to it. So how to turn webcam into security camera with the proper software listed above? The following part shows you the detailed steps to set up security camera with webcam. Note: To use iSpy for video surveillance, you have to keep your laptop running all the time. So you should turn off your computer’s sleep function to make sure it is always on. Step 1: Put your webcam in a place where needs video surveillance. You can use it to monitor and secure your front door, back door, etc. You could also decide to monitor your kids and pets, too. Step 2: Prepare a USB cable long enough and connect your webcam to your computer. Step 3: Install the webcam security camera software on your Windows or Mac computer. Here I take iSpy as an example. Step 4: Add a local webcam security camera to the software, and name it. Also check the Camera Active box to turn on your webcam CCTV camera. After connecting the camera, you can begin to adjust and readjust their positions until you are satisfied with the views. Step 5: In Edit Camera tab, you get six options to configure the webcam security camera, including Motion Detection, Alerts, Recording, PTZ, Save Frames/FTP, YouTube, and Scheduling. You only need to select the ones you want and set them up according to your needs. 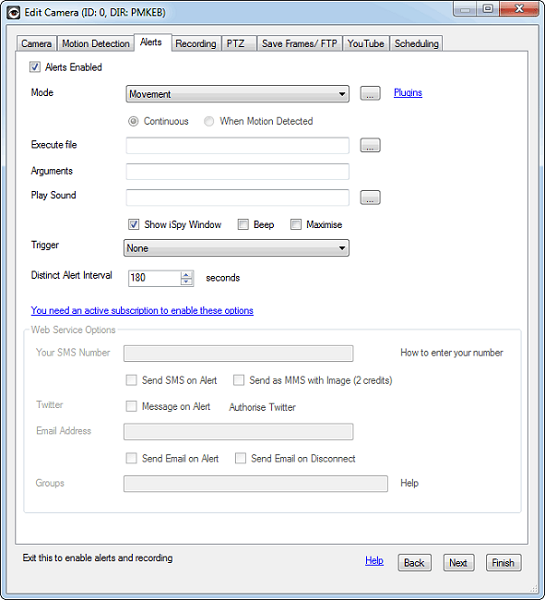 You can configure the kind of alert and notification that suits you. Moreover, there will always be motion you can opt for periodical alerts. If you are going to monitor the activities of your kids with the webcam security camera, it is better to set the alert interval – say every 15 minutes. In Camera tab, you can also set up the Microphone and activate the built-in mic of your laptop webcam security camera. Step 6: Go back to home screen and turn on your camera. Done! Then you can view the live videos and the captured pictures are shown at the bottom of the screen. A webcam security system is usually the best choice for people who have home security concerns but don’t want to spend more on an IP camera. To turn a webcam into a security camera, all you need is a PC, a webcam and very good surveillance software. Once you get all these, you are set. DIY enthusiasts can feel free to turn their laptop into a security camera. The cheap do-it-yourself feature makes webcam security cameras stand out. But meanwhile, making your webcam a security camera has its downsides, compared to using IP security cameras. Images and videos captured by webcam security cameras are a little fuzzy than that captured by IP cameras. Some super CCTV camera top brand have ultra 5MP resolution, never letting you miss a single detail. IP webcam home security cameras usually lack some features, like night vision, so you can’t monitor what happens when it gets dark, unless you keep a light on. You have to leave your PC running all the time if you turn webcam into security camera for video surveillance. 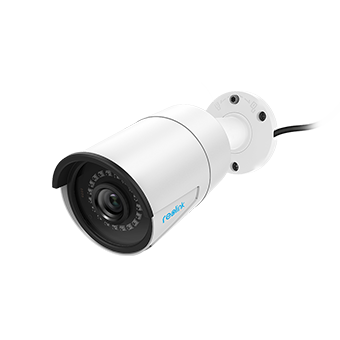 Webcam security cameras are limited to their monitoring locations since, generally, they are not designed for outdoor surveillance with the USB cable limitation. Some of you may consider placing the webcam security camera at the windowsill to watch the driveway for you, and that will cause some potential issues. A DIY wired or wireless webcam security camera does provide video surveillance for your home to some extent. Check this post to shop the best webcam security cameras. Well, if you are serious about home and business security, a more professional security camera is highly suggested, for providing much clearer 4MP/5MP images to identify faces or plate number and real night vision for 24/7 monitoring. Actually, other than turning webcams into security cameras, the webcam security camera software, like iSpy, is also capable of connecting to the 3rd-party compatible IP camera, so that you can build a centralized security camera system and take the best advantage of it. Many users choose to mix the webcam security cameras and the much more effective yet affordable IP cameras (used at places like front doors where 34% of break-ins happen, according to the statistics) to reduce the overall cost for home security. If you want a more portable solution, say no wires so that you can place and replace it anywhere indoors and outdoors, a mini wire-free battery security camera may suit you better with easy installation. To sum up, turning your laptop camera into security camera helps monitor your home and office. But if you want more, like, a long term peace of mind, try a professional and reliable IP camera. And actually they are highly affordable these days. If you have any questions concerning making webcam security cameras, you may leave a comment down below. This entry was posted in How-to Guide and tagged webcam security camera. Another option, if captured stills suffice, is https://pixeltwenty.com/picstoemail.html which is a free HTML5 app that runs right in your browser, has motion detection, and sends the captured pictures right to your email as JPG attachments. The motion sensitivity is adjustable and there is a time lapse option as well.